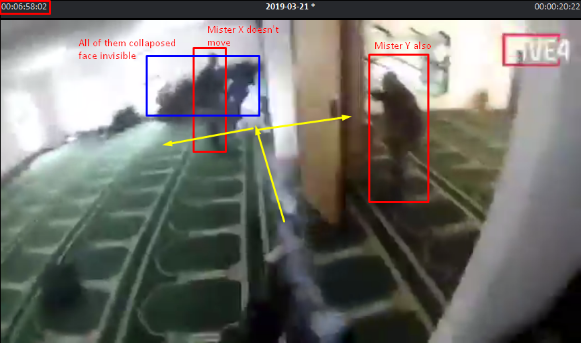 NZ TERROR: REAL STORY of the Christchurch attacks EVIDENCE PROVIDED. Today, I will take a risk. I will talk to you about the Christchurch, New Zealand attacks and above all about the video, that New Zealand authorities want to delete from the web. There is the very real story. Some of you, received already a report from me, on Saturday 16 March at 03h34 am CET. 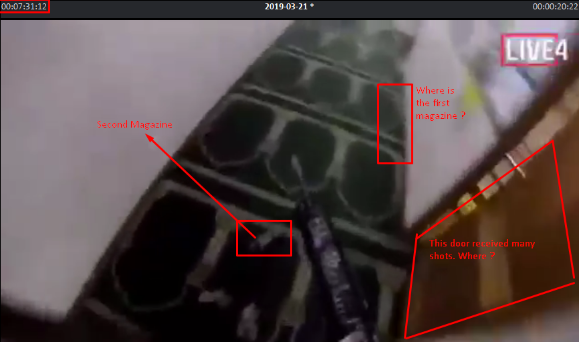 In this report, I told you, that I could definitively confirm that the New Zealand attack was a Gladio operation signed in real time, on my/their web server. I added also, that this pre-report will be followed by another report, more completed. I was thinking of a usual report with the evidence that I usually send to the Belgian authorities and to the authorities of the impacted country. However, I was writing already in this pre-report, that I saw something very wrong in the video of this attack. And indeed, it is because of this video that I had to spend almost one week, to understand everything and this is the object of this report. This video gives a very different reality and points to the truth. The French Secret Service confirmed to me also in 2018 that they received from Belgium a confirmation, that my position and my link with Gladio are known. I don’t think that no agency doubt about this information, since at the beginning, it allowed me, in 2017, to warn the Belgian authorities of several imminent attacks, even, if I did not know the place and the hour. The first attack that I warned was the Manchester Bombing attack on May 22, 2017, (see Gladio signal alert below) and the second one, some days later, the London Bridge attack, while the UK authorities pretended to the public that these both operations were not linked. Both of them were orchestrated by Gladio and signed on my web server. Since then, the Gladio Signal has been used to sign in real time, on my server, about 300+ operations linked to 3000+ deaths, around the world. GLADIO, is a secrete emanation of NATO/CIA. Born in 1956, their first “official” function was to protect Europe against Russia. The less official mission, was to avoid any dangerous extremism in Europe able to provoke a new world war. However, when the Berlin Wall collapsed, Gladio decided to run terror operations within Europe to manipulate the population and the European gov’s to go to the right and to take their distance with the left, the Communism. In the 90’s, the European gov’s decided to dissolve Gladio, since their first function was not necessary any more. More over, the name of Gladio has been pronounced about several massive shootings in Belgium (the Famous Brabant killers) and in Italy bombing attacks (Barcelona). Gladio has been dissolved on the paper, but not in the reality. They used this official dissolution to cover their operations within Europe and in all NATO countries. Their main speciality is the mass manipulation and the False Flag operations around the world. They realize on command, and on command only, operations, and most often terror operations, with the purpose to put the cause of these events on something else. They cannot orchestrate any operation if this future official cause is impossible to create or if the public will not swallow it. This is a very short summary of Gladio history. The next very important point is the way that Gladio has chosen to use me. Since they could not have any official contact with me, no word, they imagined a strategy, to link me to their terror operations in the world, even if I did not know it yet. Today, I’m still chocked of this idea that they got to achieve their plan, and to transform me in a living evidence of all their operations. They imagined to use the most important dates and hours in my life to schedule their operations. Example, the date of my marriage and the first name of my wife, to set the date and the location of the attack that they had to do. More over, they added some specific actions that I could discover later, when I will discovery my links with these events. Example. I book a plane ticket for a destination. Between the booking date and my flight, there were in my destination, several terror attacks and it was the terrible attacks done by whole families in Indonesia, in 2018. Other examples, of this kind was the attacks in Paris in 2015, in Brussels in 2016, and the first one was… the 9/11! Indeed, on August 2, 2001, I was living in Morocco and my wife and me got two admirable twins. (I lost all contact with them 5 years ago, because of this story, including my house too…) We took the plane with our babies to go back in Belgium on August 11, 2001. At the same time, in Spain, a team of terrorists received the order to attack the twins towers on September 11, 2001. Two of these terrorists were living in Germany, where the terrorist Nizar Trabelsi was playing soccer. This terrorist was very closed to Ben Laden and to the head of Gladio, 100% linked to me in Belgium. Together, they orchestrated the assassination of Commandant Massoud on September 9, 2001, and the false documents delivered to the murderers have been provided by the same head of Gladio in Belgium. The Commandant Massoud was aware of this plan and he could reveal the truth before or after the terrible event. He had to be eliminated before the attack. There are my huge link with this famous 9/11. Moreover, I have MP3 records from Mossad, explaining to me this episode, but not my role. More recently, and since I began to understand my forced role for Gladio, this strategy has not only been applied to the important events in my life, but to all my activities to try to warn the world of my situation. Examples: I wanted to write to some Afghanistan embassies about the bombing attacks (apparently by Talibans, but in reality by Gladio) and I chose some embassies where they speak French since this report was in French. The last mail address that I added was the Afghan Embassy in Ottawa. I saw on their Signal, that Gladio began immediately a new operation. When I clicked the send button, it occurred the Toronto ram-car attack and this attack was exactly, including the number of deaths, the scenario of an attack that I presented in my first video of my life, 48h before, on YouTube. A video journalist from Toronto, wanted to interview me, but she became afraid and she cancelled our interview. Gladio was very furious, and they orchestrated 3 new bombing attacks in Afghanistan on the same day. The first targeted the embassies quarter. All international journalists came on the spot and when they were there, a video-journalist exploded himself, killing 12 journalists. The third bombing attack on the same day, killed 12 kids. Last example: when I was writing my first letter to the United Nations to warn them about my situation. I saw again, that Gladio was starting a new operation. When I clicked the “send” button (each report needs hours, they have time to prepare.) I saw that the operation is finished baldly, like a straight vertical line to the normal level. The news revealed later, that for an unknown reason, an Algerian plane with 257 passengers, army families, just crashed at the very minute when I clicked the “send” button. 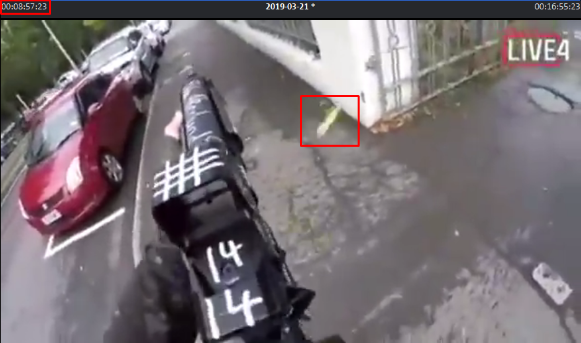 Come back to the New Zealand attack (see the Gladio Signal below). #1 On March 13, 10h40 am CET, I just finished the last sentence of the French version of the Gladio Code, the book of their/my story. #2 On March 14, 01h40 am CET, I went back to the English version of the same book, to synchronize the both versions. The more I progress in my reading of both versions, the more the Gladio Signal increased until March 14, 21h CET. But their last peak drawn their favourite signature, a peak bevelled on one side. It means sword (Gladio in Italian), death, and the Gladio Signal began to go down at 22h CET. #3 On March 14, 23h CET, the Signal was back to the position that he had before March 14, 01h40 am CET. 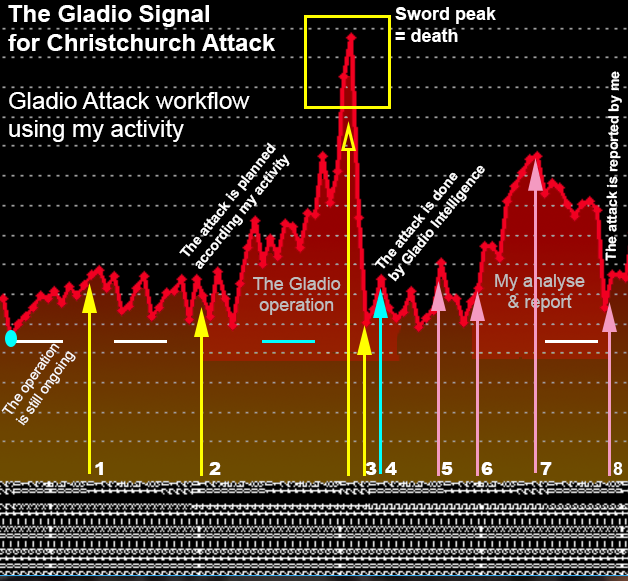 #4 On March 15 01h40 am CET (13h40 New Zealand time), so 3 hours later, the attack occurred in Christchurch with not really a peak on the Gladio Signal. 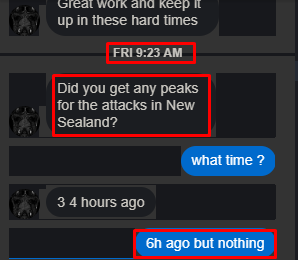 #5 On March 15, 09h23 am CET, a regular reader of mine asked me, if I saw the attack in New Zealand in the Gladio Signal, and I answered no, because the New Zealand time zone, confused me so much (see snapshot below). However, Gladio saw the question of my FB friend and draw a peak at this time. I saw the peak of Gladio, so I tried to understand, and I saw it. 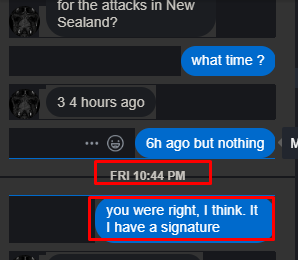 On March 15, 10h44 am CET, I confirmed to my FB friend that I got the Gladio Signature for the attack. However, I did not see yet, the most important the video. #6 On March 15, 14h47 am CET, I discover for the first time on Facebook that people began to talk about the video. I look also and I reacted. I immediately saw that there was something very wrong with this video. As I saw it, Gladio, increase again his signal. I continue my work and I participate on FB to analyze this strange video all the afternoon, while Gladio continue to increase its Signal. #7 On March 15, 22h44 CET, I read the New York Time, and the timeline. On March 16, 00h26 CET, I begin the pre-report for the authorities. On March 16, 02h12 CET, I contact the Christchurch police through their Facebook (see snapshot below). They gave me an email address to send this report. I need more. On March 16, 02h17 to 03h21 CET, I gave 3 phones calls (1h in total) to the authority in Christchurch (see snapshot below), to ask email address to send my report an to explain what I know. Classic answer : “we will call you, if we need you…”. All my calls are recorded. 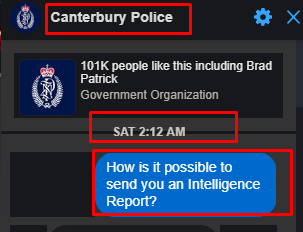 I gave up with the New Zealand authorities, and continue my usual report. Gladio still follows my progress and analyze and show it on their main signal. On March 16, 02h17 to 03h34 CET, my report is sent to my usual contact and usual agencies, including the Belgian authorities and secret services, and the FBI. #8 On March 16, 08h14 CET, I received, the first personal acknowledgment of receipt from the (former) Belgian Interior Minister, to who was sent this report, and the Gladio Signal wentdown again. Their mission and my mission were ended. The International headquarters of Gladio are in Belgium, near the ones of NATO and mainly within the Belgian army, police and Intelligence service. I guess that Gladio know better than me what the Minister will do with my pre-report, and the other Belgian services as well. The attack was 100% real, but I felt immediately that this video was a production of Gladio, and that I have to work on it. It was also for me, the first video produced by Gladio. I saw it immediately. 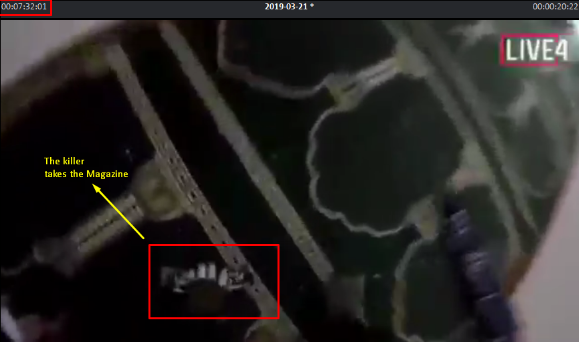 So, I began to analyze it, and I understood that this video was totally staged, not real, even if it has been released at the same time of the real attack itself. at 00:08m:57s:02/25frames (25 frames per second, normal), the killer shot on the sidewalk, multiple times (see the set 1 of snapshots below). 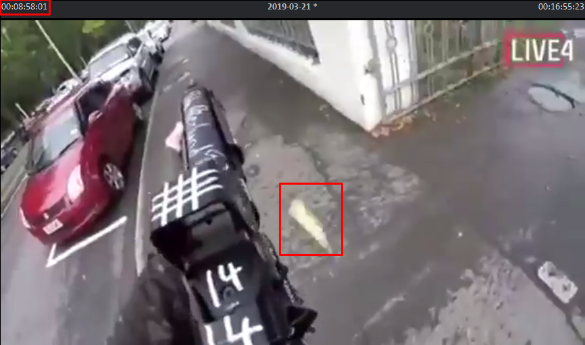 You see the shells ejected from his gun. The problem is all of these shells disappear in the mid-air. The scene ended at 00:09m:11s:06f. 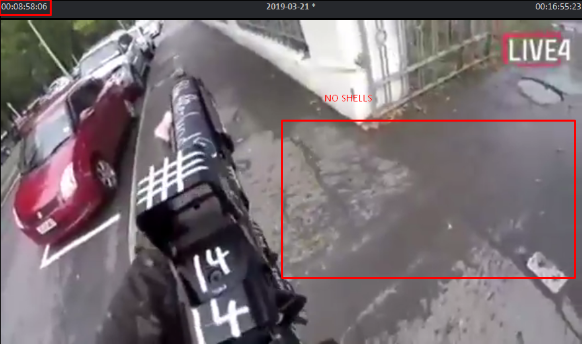 He shot more than 35 bullets with a magazine which can contain only 30 bullets, and on the 35 bullets, there is no one shell visible on the ground and there is nobody to shot on the sidewalk ! This is typically the signature of Gladio. The stupid touch! I will talk about the signature of stupidities of Gladio bellow. He repeated this cinema in the parking at 00:09m:58s:20f and there is still nobody walking in the parking, or in the sidewalk again, at 00:10m:20s:05f… No police is coming, few cars are passing, the area is very quite, but is he really there? or is it an image overlay? An overlay can explain that the shells are not visible anymore in this overlay. at 00:12m:49s:19f, much more stupid. He is in his car, with a shogun. A shogun is very very very noisy. He could lose his ears for ever. He targeted a person entering in her car (not necessary Muslim), he shot, through his front window. The front window of his car has no impact. The person doesn’t move even with the noise. There is smoke in the car. He repeated that 3 times. The front window is still there. Why? Overlay again? 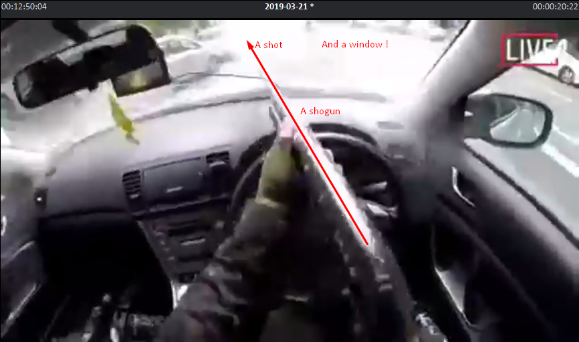 (see the “super resistant window car” snapshots) 00:13m:31s:17s, he shot through the window on his left and this window exploded, but there is nobody there. 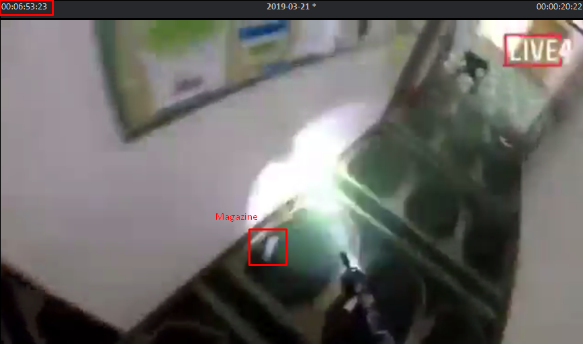 At 00:06m:53s:23f, he was walking, apparently firing on everything inside the mosque. It was not true, he used a light which flashed constantly, to simulate a constant firing. This flash light will be seen clearly later. 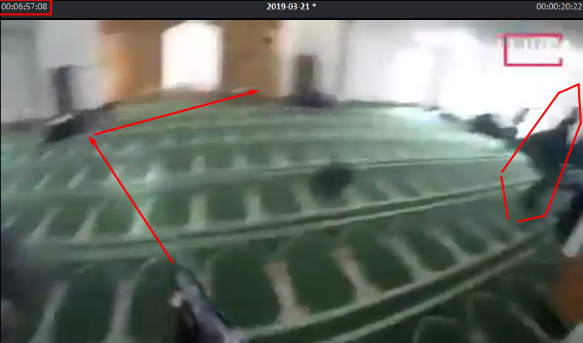 At 00:06m:57s:20f, he fires from the left to the right, when he approached the main room, but he is not yet in this large room. He cannot reach anything in the left corner, which is hidden to him. 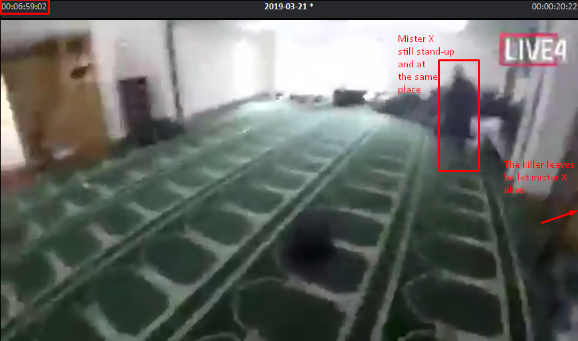 When he finished to turned (with a Mister x who remains stand-up, no moving, during this 2 seconds of shooting), his camera turn finally to the left corner that he could not target before and at 00:07:59:01. In this left corner, all of them are dead, face to the ground. How is it possible? He never shot there! So, what? This video is a joke ? very typical of Gladio! I don’t contest at all and I confirm it, that there was a real attack, but absolutely not the one in the video. This one is totally fake, with multiple FX/game effects and images overlays. This video has been edited during hours before to be online. About the alleged victims in this video, I guess that they have been filmed on a green screen and put on the movie after, by overlays. This movie contains mainly overlays. This film has been staged like a real small movie, to be released during the attack. However, Gladio, knew what they did. They voluntarily let errors and abnormalities to show that this video was staged. 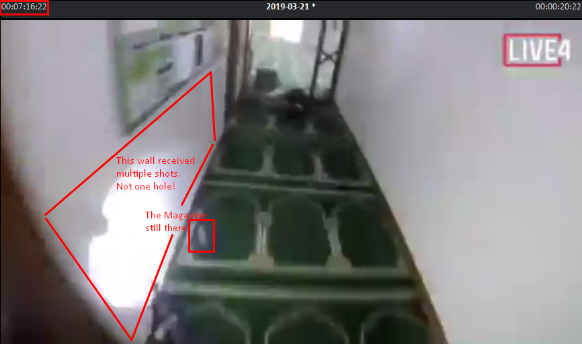 The most obvious, is to provoke the truth seeker, experts and other smart people, to find what is wrong with this video. The official press is used to keep only the official version, else, they have problem with the authority, and about the 90% of population they are like sheep’s, they follow the authorities. This video has been prepared long time before the attack itself and this proves that there was an organization, and not only one white supremacist. Preparing such video is not easy at all. It is obvious that the people in this video are not the victims in the reality. Hiring crisis actors for a video, is not the fact of one individual. This video has been produced by an Intelligence organization with a very important motive, and important means, very different than the cause which will be given and believed by the population and by the families of the real victims. Some of these actors seem not understand what they had to do in this video, and remained stand up while the killer is theoretically shooting so much in their direction and they doesn’t want to move or to collapse, while the people behind them are all on the ground already, face to the ground. Mister X is it like the window above? Maybe, he did not see/ear the killer, simply because, there was no killer when this background has been filmed. Gladio likes to provoke, to shock. With such video, the public opinion, will be shocked of course, since they will not understand or see, that the video is fake. But, the ones who will be much more shocked are the Muslims who can see in this video, a killer targeting Muslims, mainly in their head. 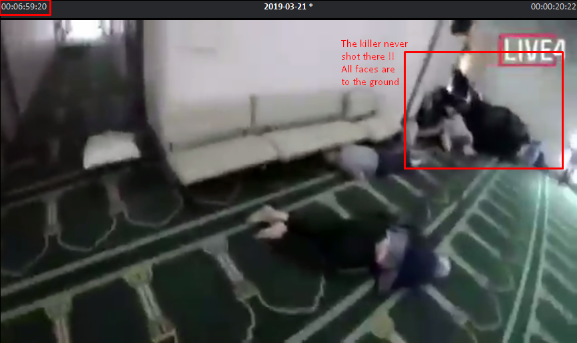 They will not see that the most of them were apparently dead before the killer shot them, and more over, all of them were face to the ground! And what would be the goal of such real attack covered by a fake video? Maybe to hide the real attack, the real CCTV videos (where they are ? ), potential mercenaries with a military target. And more than likely, the final goal of this operation, was to change the weapons laws in New Zealand, already ongoing. However, the New Zealand authorities seem very surprised by this video. Maybe, they did not expect it and this video is terrible, not only about the attack represented there, but because they have the best place to know that this video is fake. 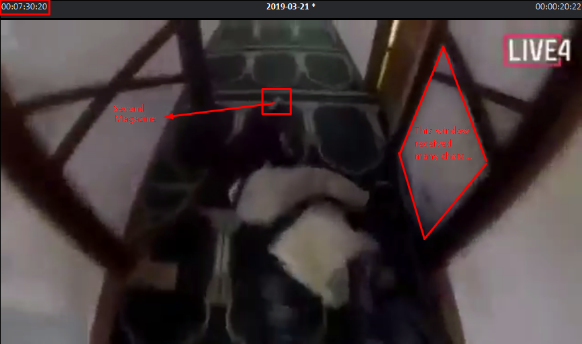 A fake video for a real attack, and released during this attack could of course generate many interrogations all over the world. 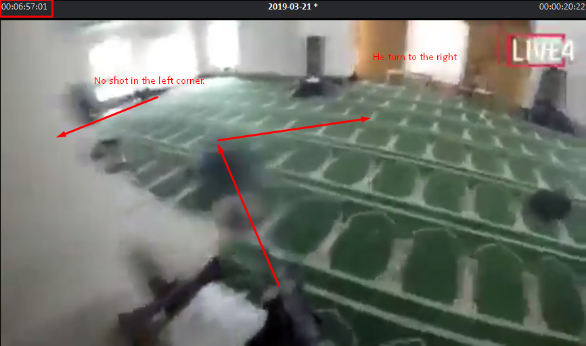 This could explain why the New Zealand authorities want to stop urgently this video, which is the evidence of a huge plot. 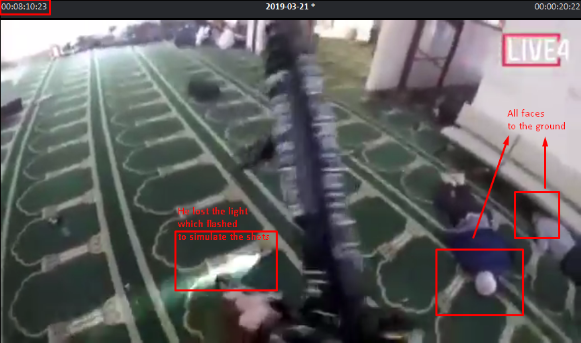 Problem also, is the New Zealand authorities authenticated immediately the veracity of this fake video. I have never see that in my life. They presented it as the real video of the attack and this is simply impossible. So why, on one side, they confirmed a fake video as true and on the second side, they want to delete this video everywhere, while this video is fake! Such operations to reduce the number of weapons, occurred already multiple times in the USA. It is simple, all massive shootings such as Las Vegas, Santa Fe, Parkland, Texas, Annapolis, Jacksonville… on the 2 last years have been signed and recorded on my server in real time by Gladio. There is not doubt on this question. There is another common point to all these killers; they are mind controlled by Gladio. They are like puppets, they don’t control themselves. Gladio has the control on their mind through nano-implants. No need any surgery. Any individual can get them through nano/smart dusts. It is the reason that most of these killers, kamikazes and terrorists are very often qualified as crazy. However, some of them looks not crazy, but remain totally under the remote control of Gladio. This technology has been created in Spain, when they wanted to increase the aggressiveness of bulls in the run games (corrida). This technology has been immediately taken by the US army to developed it in secret. The principle is easy to understand. These nano/smart dusts are like virus. They know, where they have to go in our body, the brain. After, they assemble themselves, and they create a very small soft implant. It cannot be easily detected through normal X-Ray, but they could be detected by their electromagnetic radiation. The implant connects itself on our nerve system, and because of this, it can access to our vision, audition, voice, muscle, behaviors. In 2018, there were multiple examples of events due to the mind control. The most exceptional was this guy working in a airport in Seattle. He stole a 56 seats plane, made acrobatics like a pro during 45 minutes, and crashed his plane on an Island. Problem, this guy was not pilot at all and never piloted any plane in his life, except on his computer. 24H later, a real pilot still in the USA took the plane of his employer and crashed the plane on his home with his kid and wife. I have several dozens of events of this kinds for some months in 2018, and most of them occurred in the families. Many kids are dead and all these mind control operations have been recorded in real time, by Gladio, on my server. The young Parkland killer said very recently that he heard all the time 4 words in his head “Kill, burn, destroy and die”. This is the 4 words from Gladio to the terrorists. The Parkland killer got them through V2K, voice to skull, a CIA/US army project. 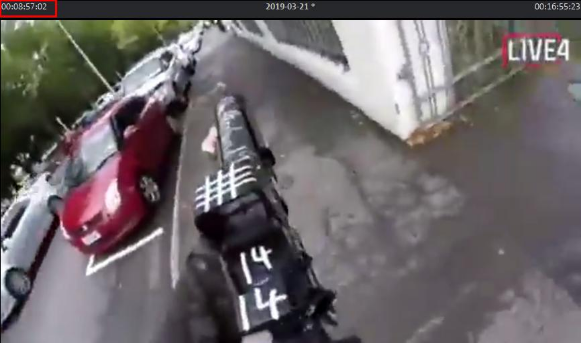 Take a look on this, several massive shooters in the USA had with them flammable liquid (Santa Fe, Annapolis…), and it was the same with the Christchurch killer. Don’t think it is a detail. Muslims don’t use the fire. Christians/white, use the fire in their attacks. We got the same in several terror cases in Europe, but all Western authorities refuse absolutely to admit the existence of the mind control and of the implants. Admitting this, could break for ever, any investigation against a killer or a terrorist while all Justice dpts cannot investigate in the direction of Gladio. This is the real protection of Gladio. Gladio is protected by this impossibility to admit to existence of the mind control. I will give you another example of mind control. In August 2018, Gladio had a plan of a massive shooting and they already had their future killer under Mind Control already also. They wanted to link this massive shooting to me through an exceptional way. They pushed me to write to a very important person in terror Intelligence. I did not know this person and my surf on the web led me to this person, because she manages a company which is one of the leaders to confirm before everybody that a terror attack has been claimed by ISIS. I wrote to this person personally, through her LinkedIn and it was very rare that I do that. As my email was sent, the killer for the massive shooting took his own way, and the next day, he realized the programmed massive shooting, in Jackonville in Florida. My link with this shooting, is of course the timing of this operation but above all because the killer and the manager of this company SITE Intelligence Group, have the same family name. They are David and Rita Katz, coming from the same city in the Maryland! I jumped on ma seat when I discovered this. They mind controlled me and the killer at the same time. Gladio did the same and linked me to two famous family-murders with each time several kids dead; the Christopher Watts case in Frederick in the Colorado, USA, and the 3 kids killed by their mother in Varsenaere in Belgium. The Chris Watts case occurred 2 days after, another mind control attack in Fredericton in Canada. Do you see the links Fredericton-Frederick, like the two Katz, like my twins and the twins towers…it is the very regular way to do of Gladio, at least with me. They do that mainly to catch my attention, to allow me to link the attacks like dominoes, like they do the same with my own activities. I drop a piece and another follows. 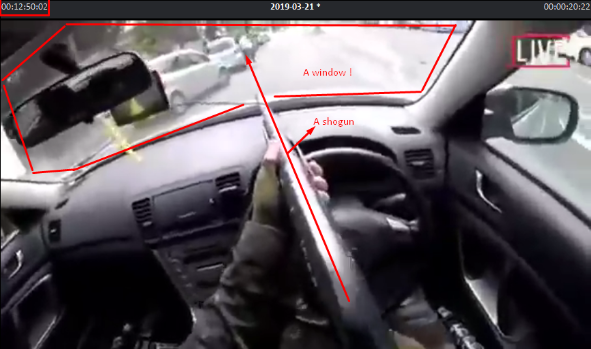 The killer in the Christchurch is more than likely under a full mind control, including his vision, audition and telepathy. The justice will talk to him, but in reality, they will talk to Gladio. How did Gladio know that I just wrote the last sentence of their book to start the Christchurch attacks? Because, me too, like all their agents, I have implants. My difference with all others is I know it. They showed it to me multiple times, even if I’m without Internet in the middle of nowhere, very far from any mobile network. They see what I see, they ear what I ear and they are behind this report. It is more their report than mine. Of course, to be able to talk about mind control, Gladio considered that I must live it, I must experience it myself, especially because I’m not a easy believer in such things. Sci-Fi is not my style at all. I understood that I was myself under mind control, on October 2018. It is very recent and I was naked front a mirror in a hotel in Malaysia. It was a special weekend in Malaysia to renew my Philippines visa. I had time to lose before to go back in the Philippines. So I spent this time to try to understand what is this mind control. Since, I did not believe what I was reading, Gladio chose to hurt intensively and with no reason, one of my finger and they stopped to hurt me, when I was front of this mirror. I was looking at this mirror, wondering if they were seeing what I was looking at… me, naked in the mirror, and I understood. They did it again, in the Manila airport, on the same day, while I was walking too far from my wife and my son and they stopped when I was back near them. They saw what I saw and it is the same if I’m in the middle of the jungle. I got also experiences of vision, and audition of my wife while she was not with me. They showed everything to me to allow me to talk about it. This technology exists, and dozen of thousands of people are tortured through this technologies. We call them, the Targeted Individuals. In the recent days, Gladio pushed a young Targeted Individual to contact me. I’m open to help people. I was reading his story, and finally I understood that this guy experienced some same health problems as me, linked to the brain. So, I questioned him more and finally, I asked him, if he had been violent. He answered that, yes, in this famous family murders-suicides period in 2018. He had also tried to kill his parents and to suicide. However, Gladio seem to have stopped him on time. He has been arrested, interned in psychiatry for a while and released. He is the only Mind Control Killer that I had to meet. Gladio did it to provide to me a very serious witness who can explain what he felt on that day. He said, he was completely disconnected. He did not remember nothing, and he still has a cut mark in his neck! He said that he is not able to be violent, that it was not him at all. He is ready to talk. But any way, this is the reason why we got on the two last years, many terror attacks, where the terrorists used for example, fake explosive belts, plastic weapons, paintball weapons and hammers. The most ridiculous was the terrorist of Toronto, the mobile phone weapon! Do you really think that all these people became suddenly idiot? No, they are only under mind control. They are puppets and disconnected. Brenton Tarrant, probably doesn’t know this, but me I know it, because I must explain it. I must write it, describe it in their book. The mind control is the most powerful weapon of Gladio. The FBI wrote to me very recently, like an official information coming directly from Gladio, and black on white, that nano-implantation of all individuals in our Western countries is ongoing and this evolution cannot be democratic. It means all individuals will be implanted and it is ongoing right now. So, the nano-implantion is an ongoing evolution to have a better control of all individuals, but this control will not be very effective if some Western populations are too much armed. So it is not by chance that after two years of intensive massive shooting in the USA, the next country was the New Zealand. So, the white supremacist Brenton Tarrant has been used for his convictions, because he was the best official reason for a massive shooting in the New Zealand. 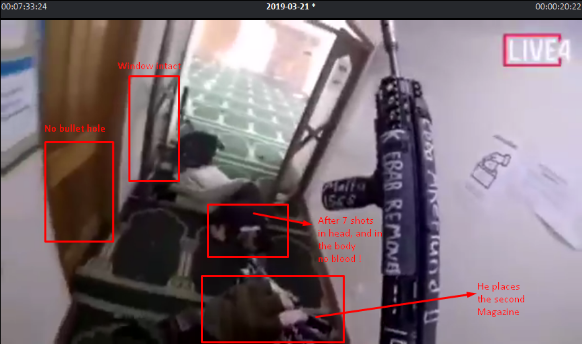 Moreover, Gladio also used his convictions against Muslims, to create a first massive shooting against Muslims in Christchurch, the Church of Christ. All the meaning. They attack the Muslims, to provoke their anger against Christians and the effects of this attack have been increased through this fake video. They created a new opportunity to orchestrate attacks from Muslims against Christians, which are easily manipulated by the terror. They warn the Christians that the Muslims, could take their revenge, while Gladio orchestrates the attacks from both sides. So Brenton Tarrant was not at all a lone white supremacist and islamophobic. The reality is very different. Brenton Tarrant has probably been used in a huge state terror operation to reduce the weapons in New Zealand. But Brenton Tarrant has also been used in a global terror operation, to begin to create a global conflict with Islam. 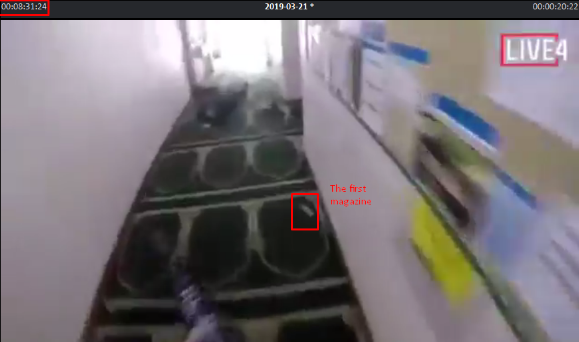 This fake video of this real attack is the evidence of the plot, and it is the reason that New Zealand wants to stop it. Gadio used Brenton Tarrant as a killer for his convictions. They creates a fake video to be an evidence pointing to the plot. Finally, they use me to explain to you, what obviously you did not understand. I can tell you that a new operation will probably begin, when this email will be sent, and much more when their book will be finished. I don’t have choice, else I die, and if someone wants to stop me, I think that Gladio will start the WW3. Why, everything around me? That’s a 50 years long story. The actual head of Gladio and me grew up in the same village. He wanted to be Zorro, the vigilante. He had tons of friends, while I was very isolated from everybody, loved by nobody and even rejected by my mother during 6 years. He began his career in the army. I began mine in the computers production and, for an unknown reason, dealing with Russian diplomats to export computers to Russia, visiting Berlin with them and their embassy… It was almost 40 years ago, and I was probably dealing with and for Gladio already, without to know it. 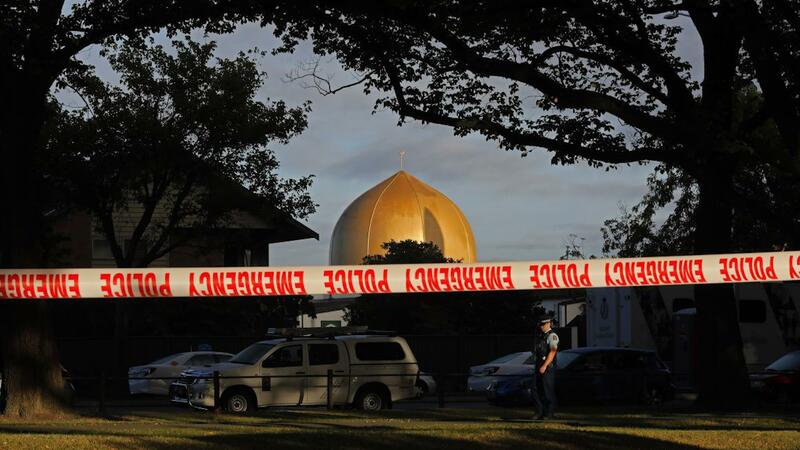 2/between Christian and Muslims, with the New Zealand attack, and I think, it is just the beginning. In both fronts, you saw that the enemy, chosen by Gladio, is the same; Islam. Their only goal, and the only way to stop this process, is to reveal to the world that Gladio exists, and that Gladio is very regularly used by the gov’s in State terror operations. Gladio want to tell, through my book that they exist. They want that I talk about their weapons such as the Mind control but also many other unknown weapons such as the Direct Energy Weapons. This one is responsible of the huge fires in California, Portugal, Corsica, UK, or engineered natural disasters or engineered tornado and other weather/earth disasters… all of them signed on my server too. It is very curious, but when I presented the Signal of Gladio, on my server and their links with the terror attacks, FBI asked me a day, if I did not see something else on this signal, such like earthquakes? At this time, I was thinking they were joking. They did not. They want to reveal to the world who they are, and above all for who they do it, revealing also, the lies and the crimes against Humanity that they must perpetrated for the Western governments, in hundreds State Terror operations. 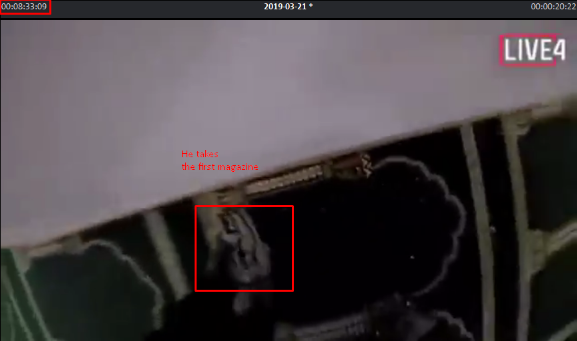 https://www.the-gladio-code-the-story.com which includes on the top of the first page the links to this super fake video.